The demand for knitted hose, which had begun in the 16th century, led to the development of framework knitting machines which became a dominant feature of the East Midlands for over 200 years. Framework knitting provided an alternative occupation for those unable to work in agriculture, although wages were notoriously low  around six shillings a week was an average wage, compared to nine shillings for an agricultural worker. 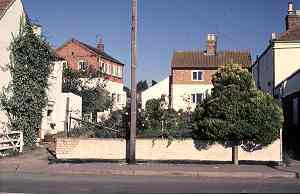 It is difficult to establish how many frames operated in 18th-century Wymeswold, but in the census of 1844 there were only 10 frames in Wymeswold, compared to 1,209 in Shepshed and 343 in Ruddington. By 1851 it is estimated that there were 60 frames in Wymeswold and in the population census for that year some 140 men, women and children are registered as dependent on framework knitting, with 83 on lace making and 360 on agriculture. In 1878 various reforms, including compulsory education until the age of 10, meant that frames moved out of cottages into factories or purpose-built frameshops. The women worked the factory knitting machines while the men moved to engineering or the shoe industry. In the 1861 census the Wye family are registered as hosiers but by 1871 they are bag hosiers. These were middlemen who made large profits out of framework knitting. The house which is now No. 9 Brook Street, was purpose-built for frameshop use. It is an excellent example of the design with long, light windows and solid square shape, and is still referred to as the Wye Building. The Wye Building (No. 9 Brook Street) at the end of the range of buildings on the left. Photo taken in 1993. 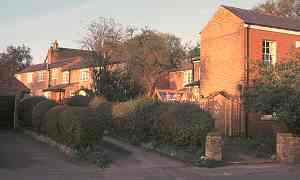 Another house (on the extreme left) on Brook Street with first-floor windows characteristic of a frameshop. Photo taken in 1993.